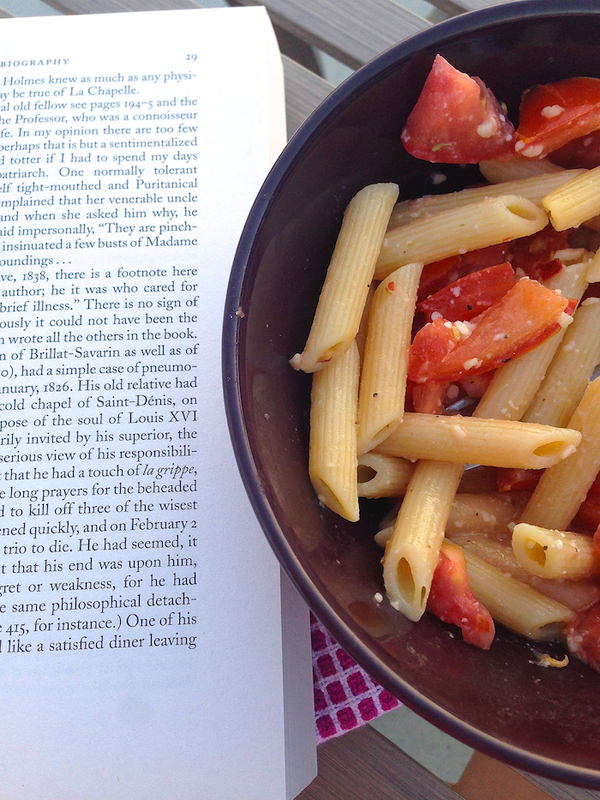 Sunday pasta has taken on new meaning this summer. 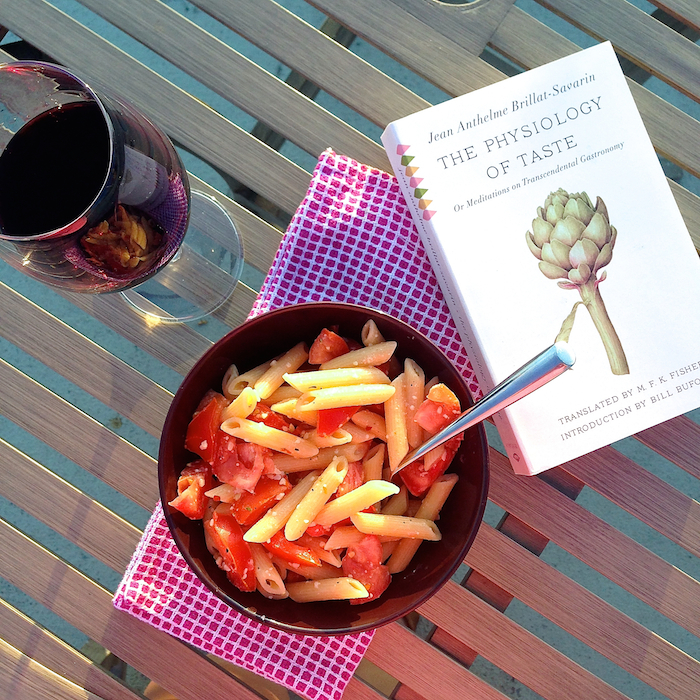 It’s still my chance to cook, unwind, and zone out at the end of the weekend. But it’s also been a bit of a refresher too. A creative stimulant that’s just for me before the week starts. 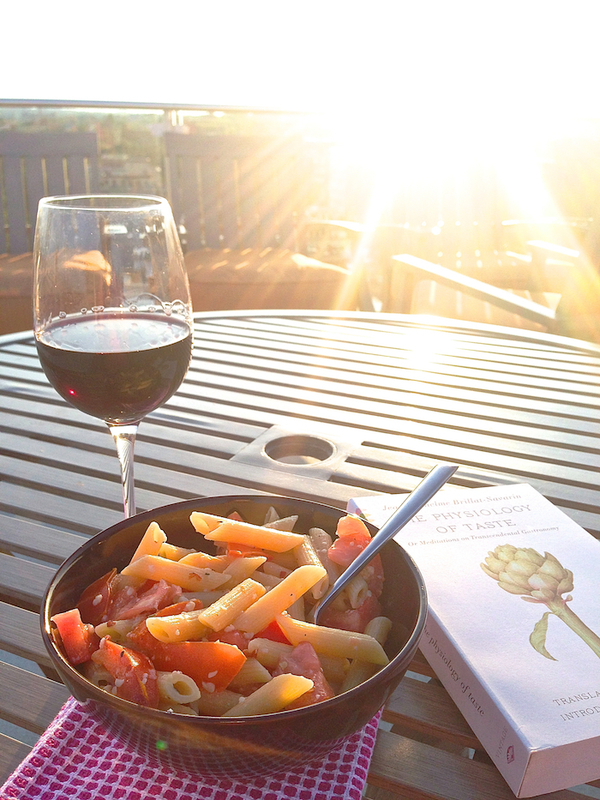 It’s helpful that it’s light out so late and the weather is perfect around dinner time. The day doesn’t have to end so quickly. 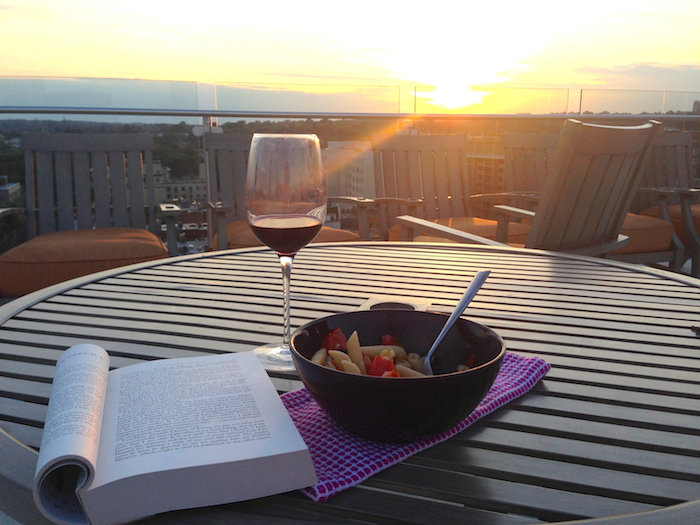 Taking my pasta up on the roof + reading a book + drinking a glass of wine + watching the sunset has become a new goal of my Sunday Pasta routine. Plus so much better than sitting on my couch in front of my TV – no matter what drama I’m into at the moment (Chasing Life on ABC Family and re-watching Brothers & Sisters on Netflix). 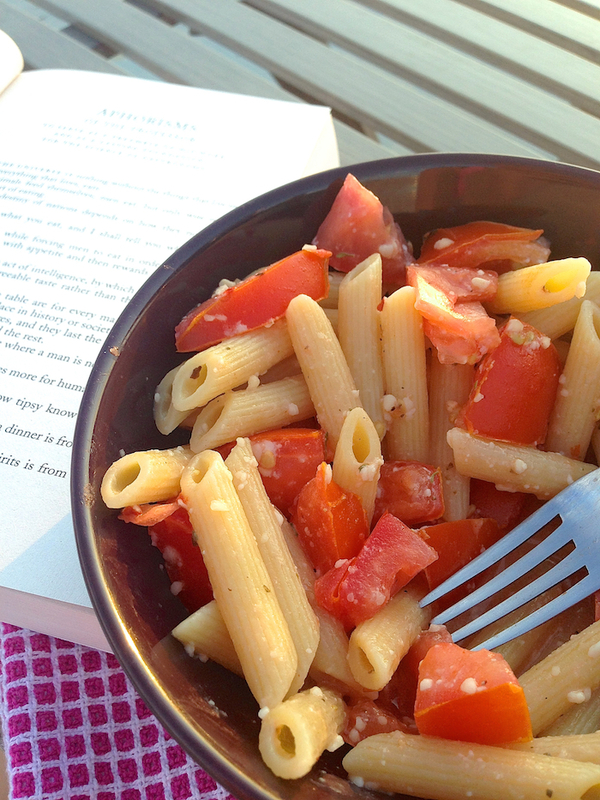 I love making this pasta in the summer. Mostly because it’s crazy easy. Also because when you have awesome tomatoes, why cook them? Just toss with some great olive oil and serve. I guess I really don’t need to add the pasta in there. A simple tomato salad is just as good. No doubt, healthier. But it’s my vehicle for my favorite things, for new ingredients, for rough days, for dates, for deciphering a book written in 1825, for Sunday nights (proudly) alone. Dice tomatoes into cubes and toss with olive oil, salt, pepper, red pepper flakes, herbs. Set aside. Cook pasta. 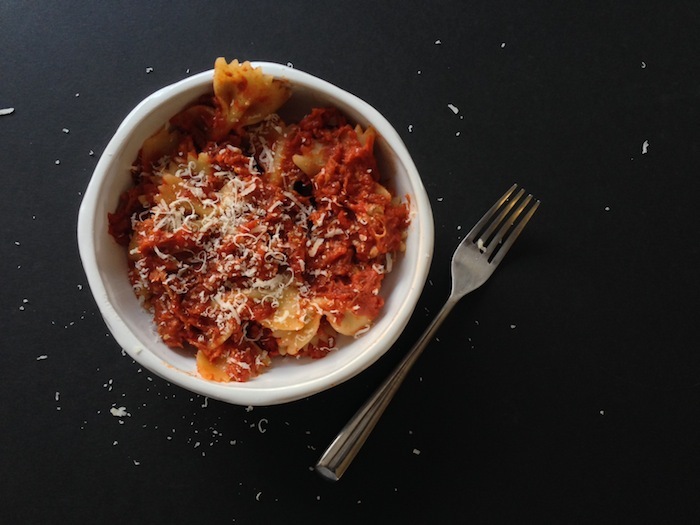 Toss hot pasta with tomatoes, a little bit of the cooking water, and parmesan cheese. Damn that was easy. Posted July 8, 2014 in Recipe by Nikki. 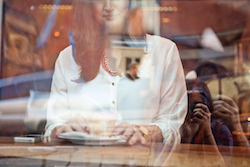 Last night my friends reminded me about some of the joys of blogging. The writing, the eating, how it can be so simple, how it’s part of who we are and how we communicate. You should read their blogs – Eat More, Drink More, District Brit, Frijolita, Florida Girl in DC – especially if you’re in DC. Beyond their blogs, they inspire me in many many ways. We were also talking about restaurants with menus that haven’t changed. We were split. If it was a good restaurant, we had a great experience, but yet it’s not a place we frequent often, are we satisfied with the same menu every time? 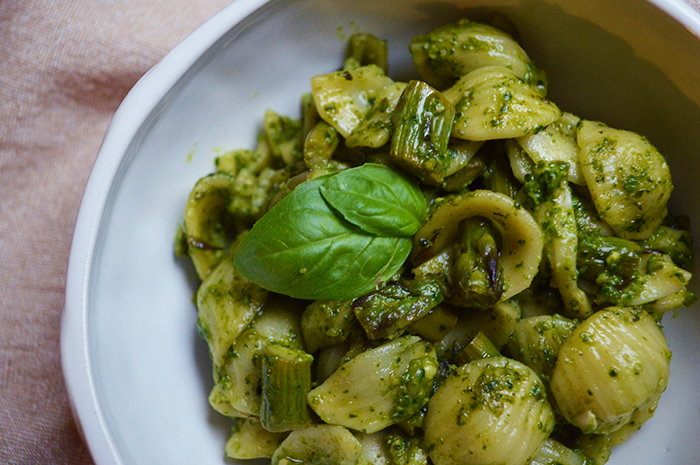 Jenna wants to go back and have her favorite dish there – a simple but lovely pesto gnocchi. Russell wants to see what else they can do. They both come from a place of adoration. The ingredients are really the way I’m going to get somewhere new. Everything else remains the same…the boxed pasta (sorrynotsorry that I don’t have time to make fresh pasta every weekend), the garlic and olive oil and butter, tossing everything together in a big pan, making a mess, West Wing or a 90’s pop music playlist playing in the background, my mom calling halfway through. 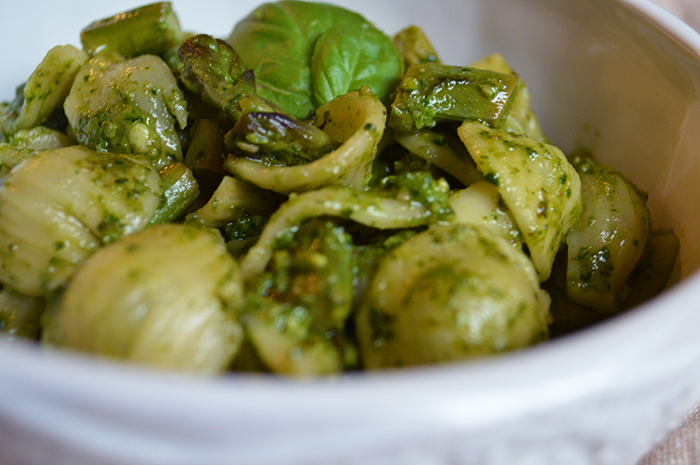 In this case, I changed things up with a spinach walnut pesto. 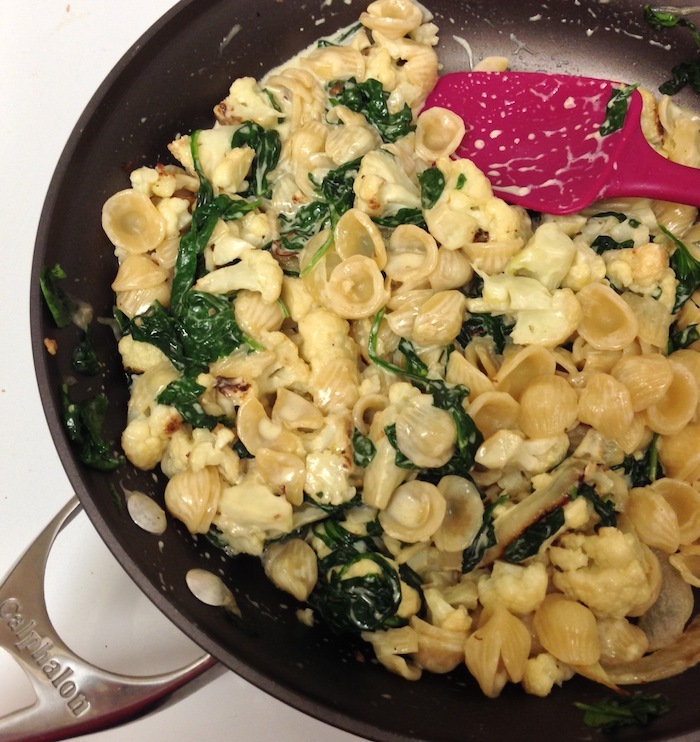 Nothing groundbreaking here, but it was different than just typically throwing the spinach into the pasta to wilt a bit. Sautéing the asparagus instead of roasting it, kept the dish feeling lighter and added some texture. 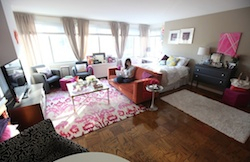 And how can you not be inspired by that bright pop of green? I’m sooo healthy even though this is full of carbs, yeah? Let’s pretend. In a food processor, combine handfuls of fresh spinach, fresh basil, walnuts, olive oil, garlic, salt, pepper until volià you have pesto. Chop asparagus in small pieces and sauté in butter and olive oil until cooked through (depends on how much of a crunch you’d like). 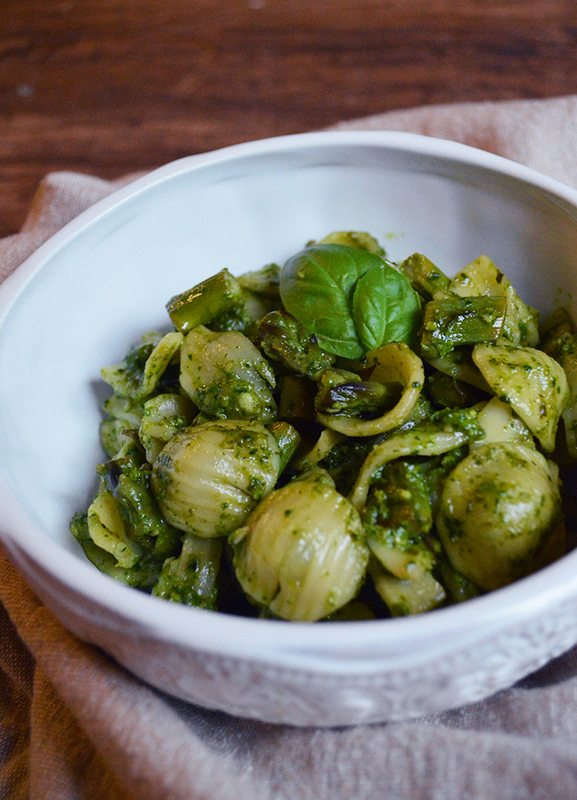 Add the pesto and cooked pasta to the pan. Toss. Buon appetito! Posted June 25, 2014 in Recipe by Nikki. While between trips and traveling, I’ve been able to get back to a semi-normal routine the last two weeks. That means getting back to the farmer’s market on Sundays, stocking my fridge, and cooking again. 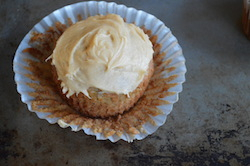 It’s great to feel some sense of normalcy while in the kitchen. Like this is my thing. This is my home. 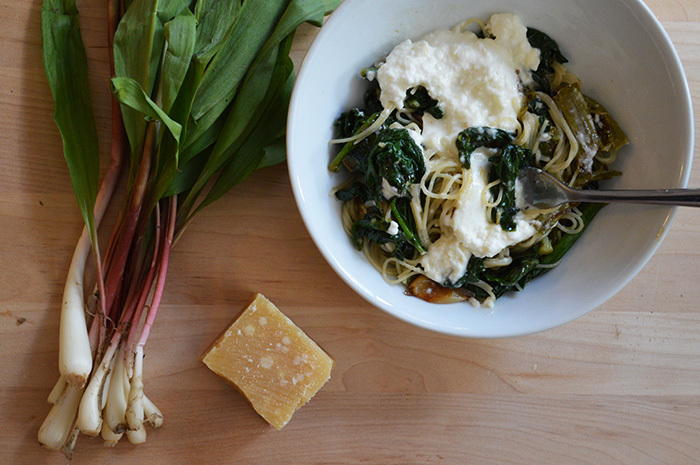 This Sunday pasta is basically just me being super stoked about everything new and green at the market – spinach, ramps, asparagus – and putting it together. Oh and treating myself to $10 burrata. 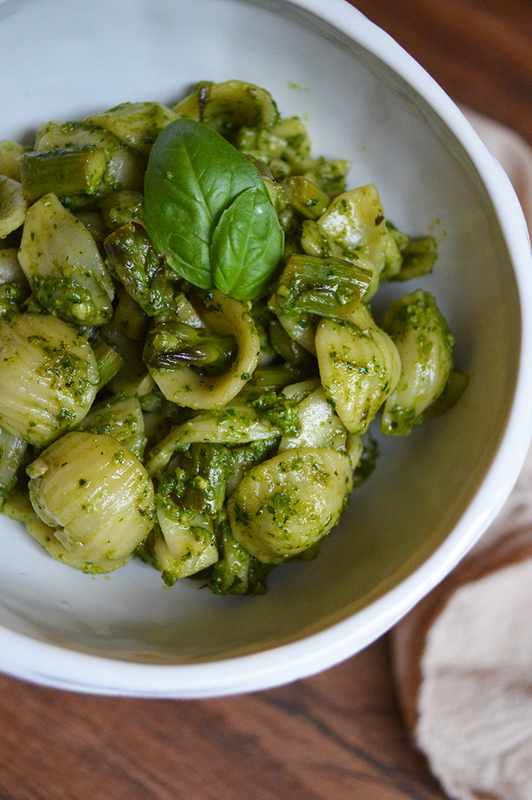 Roasting the asparagus adds a deeper flavor to the light pasta. 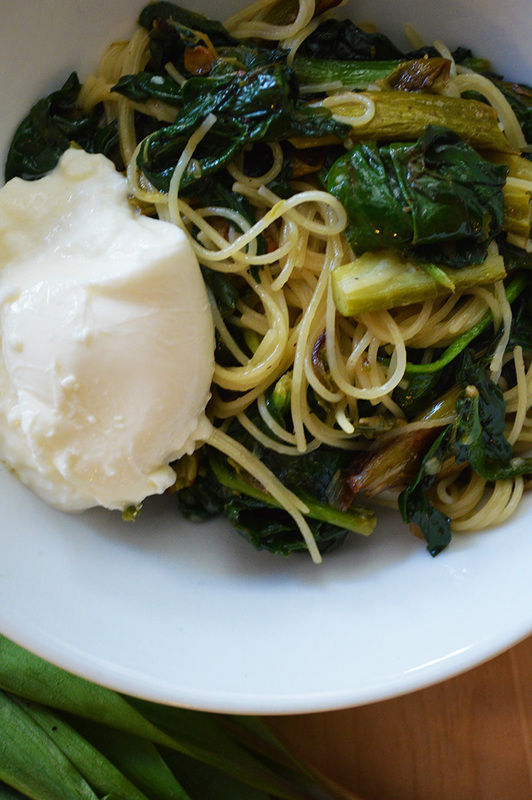 The creamy burrata pulls the whole dish together. 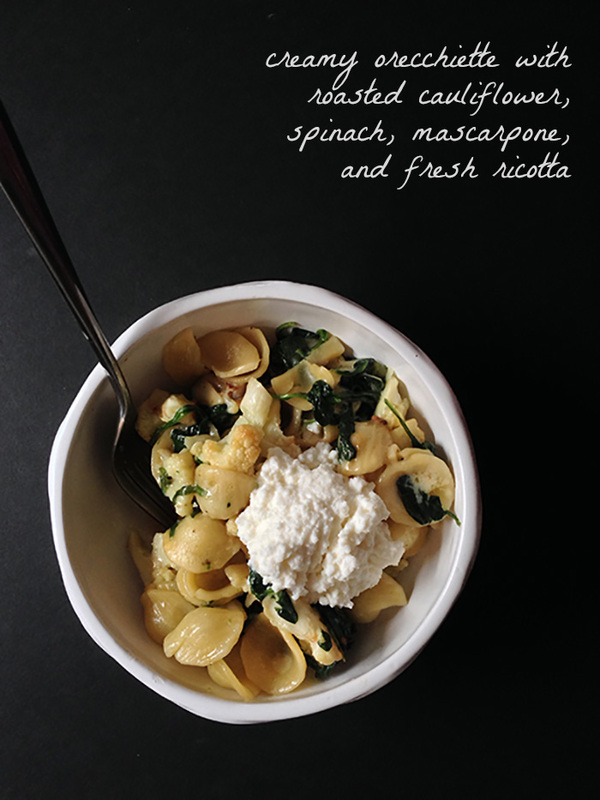 I basically want to live inside this pasta when it’s spring. Preheat oven to 400°. On a baking sheet, toss asparagus and garlic cloves with olive oil and sea salt. Roast for 25 min. Meanwhile, sauté ramp bulbs in lots of olive oil and butter. Add in ramp leaves and let wilt down. 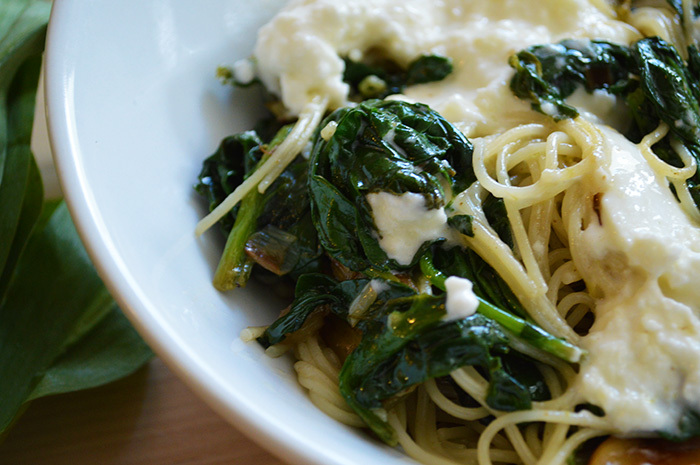 Add in a bunch of fresh spinach and let cook down. Remove asparagus and garlic from oven, chop, and stir into the ramps and spinach. Grate in fresh parm. Cook pasta and toss with veggies. 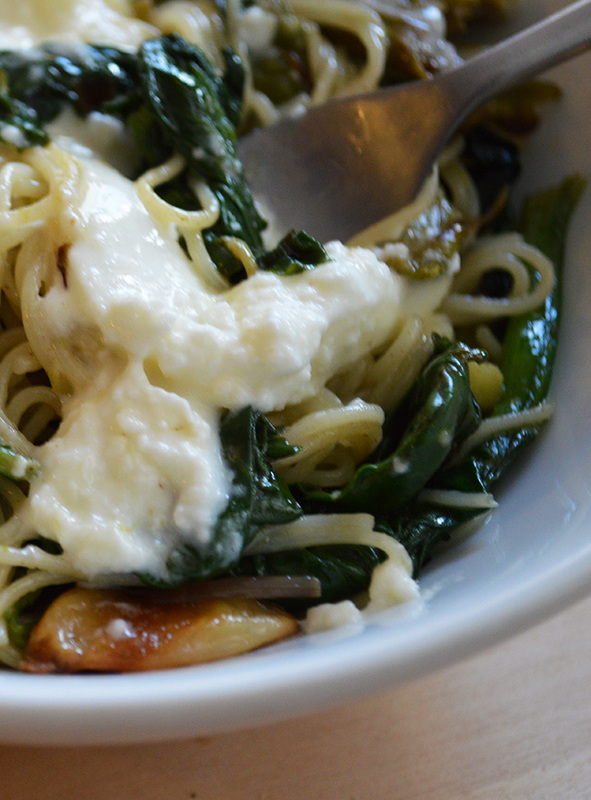 Stir in fresh, creamy, burrata. Posted May 13, 2014 in Recipe by Nikki. Are we over this snow yet? Another day at home…bundled up in a fuzzy blanket, sipping coffee, working, as the snow falls sideways. It’s nice actually, to have time to myself. Power through emails, no distractions, wearing the comfiest pajamas all day long. A break from trying to impress and entertain constantly. So maybe for one last time, I’m thankful for the snow. Last one though! Chop cauliflower in small bite-sized pieces and place on a baking sheet. Toss with olive oil, salt and pepper and roast for about 20-30 minutes at 400°. Meanwhile, sauté chopped onions and garlic in butter and olive oil for a while until onions have softened. Add a whole bag of baby spinach and stir as it wilts. Add some heavy cream and and a spoonful of mascarpone into the sauce. Toss in roasted cauliflower and cooked pasta. 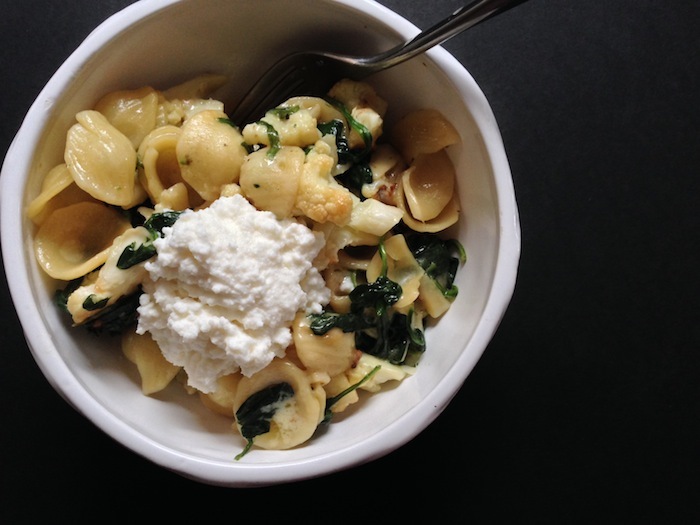 Serve with fresh grated parm and a dollop of fresh ricotta. Posted March 3, 2014 in Life, Recipe by Nikki. I made this pasta for a boy but I ate it alone. More for me. I made it spicy cause he likes it spicy. But turns out I like spicy too now. Sometimes, well most of the time, things don’t work out the way you plan them out in your head. 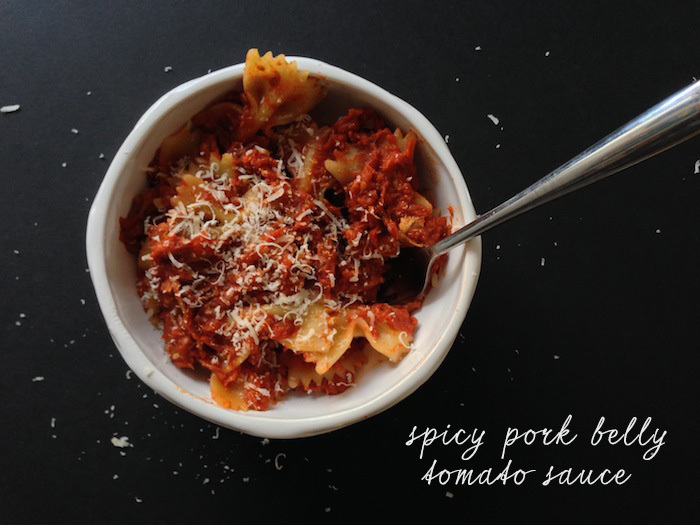 But other times, like in the case of this pasta sauce, they turn out even better. It could be the incredible pork belly. It could be the anticipation of sauce bubbling on the stove for hours…letting my favorite smells (garlic, onion, mmmm) fill my entire apartment. It could be that because the boy didn’t show, I got to eat this in sweatpants while watching Pretty in Pink and sending silly snaps to my girlfriends. Clearly I won this one. In a heavy pot, sauté minced onion, shredded carrot, a big pinch of red pepper flakes and garlic with some butter and olive oil. Add a large can (or more) of crushed tomato and bring to a simmer. Add cooked pork belly. (I got mine from Chef Dimitri at Cava Mezze, but you can easily make your own too. I like this 3-step recipe.) You don’t need a lot. I used about a half a cup. Shred in sauce. Simmer for as long as you can stand it…an hour at least. 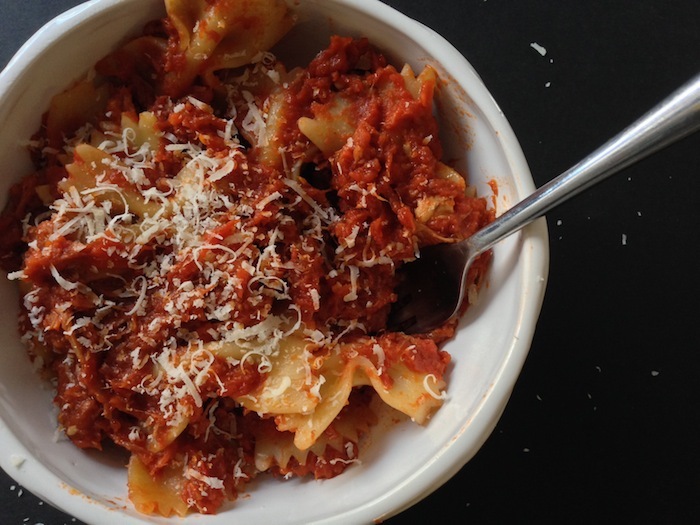 Serve with pasta (homemade if you’re feeling ambitious) and fresh grated parm. Posted February 5, 2014 in Recipe by Nikki.